Writing About Writing (And Occasionally Some Writing): Xanth? Seriously? I know most lovers of science fiction and fantasy deal with Xanth novels through the lens of rose colored nostalgia. We remember the adventures of Bink and Dor from our days of youth. 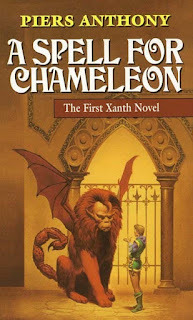 It's also truth Xanth might be the ONLY series that some people have read, literally because clocking in at an insane THIRTY-EIGHT (38) books there are SO MANY Xanth novels that there is actually a 19.7% chance that any book in the world (ever) selected at random will actually be a Xanth novel. But better than Dresden? Seriously? I don't know about that. I knew Xanth was a funny series when I put it on the poll. Everyone claims to hate Xanth and find it totally immature and sophist, but it mysteriously still does crazy well on poll after poll after poll. Xanth is like the "Dukes of Hazard" of Fantasy series. It's the guilty pleasure of hundreds of geeks who want to look down at it, but are horrified when the heart wants what the heart wants. That's why it's important to vote. If you don't vote, you might have to be satisfied with these results. You may have to know you let the moment to do something pass you by. You may have to look your little grandchild in the eye one day when they ask "What did you do to stop Xanth from being the best," and you will have to say, "I did nothing. I knew what was happening and I did nothing to stop it." And then...you will see the love in your grandchild's eyes die. And many years from now, when facing your disappointed grandchild, would you be willing to trade all the days from this day to that one for one chance--JUST ONE CHANCE--to come back here and tell our enemies that they may take our lives, but they will never take OUR FREEDOM!! probably haven't read much Scifi/Fantasy series as adults if they like Xanth so much. The poll is down on the left, right above the About The Author. EDIT TO ADD: It was as if with this post, everyone around the world realized that for evil to succeed, all that is required is for good men to do nothing. Currently Dresden has pulled ahead of Xanth, and the current numbers for Xanth mean that it won't be going on to the finals. I loved his Xanth stuff. Then I read some of his other stuff, got squicked, and couldn't read his work at all anymore.